I think DryCreek is a closet animal rights activist. I wasn't my intention, but it's dang sure working out that way ! I would like to have the trap in my creek bottom, where there's better hog traffic, but I can't get a cell cam signal very well there. If I don't get some hog action in another month, I'm moving the sucker anyway ! Last edited by Drycreek3189; 02-10-2018 at 01:52 PM. Have you tried a booster for the camera? I've seen people talking about boosting signal on trail cams before. 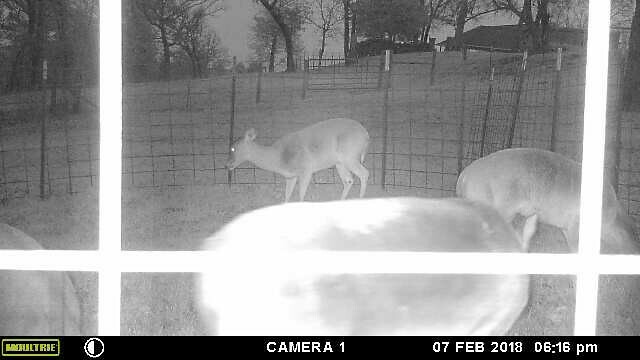 Hogs know it's not deer season, they only eat corn during deer season. Lol! Well, good luck with whatever you decide(deside) to (two, too, 2) do. After seeing a lot of hog activity in my area, I decided to put a corral trap with a funnel door. Currently, it's open and with corn, but all I get is raccoons and deer. These hogs are smarter than I thought. Or maybe I don't have the right location. Last edited by tekparasite; 02-10-2018 at 03:30 PM. It's hard to see how heavy-duty your gate is... The guillotine style has to be pretty straight and the channels it slide in square for to slide shut freely. Trapped hogs will run across the trap at full speed and slam into it, repeatedly. If it's too light duty they'll either break through it or bend it so much that it won't close. It's made of square tubing and pretty heavy. The frame that it slides in is made of angle iron. It drops well and is a booger to set by myself since I only have two hands . This isn't the first time I've used it, just the first time with this trigger. I've caught hogs in it before, and my experience has been that the hogs will hit the pen everywhere and not just concentrate on the gate. The biggest hog I've caught in it probably only weighed 150 lb. or so, usually the bigger hogs won't go in. I think others trap around me and these hogs are trap shy. I also have a box trap and I've never caught a hog in it at this place. I've never had a problem with the bigger hogs being "trap shy". The biggest hogs are old boars, which are usually solitary. The spookiest hog and the last one to enter a trap is usually the matriarch of a sounder. 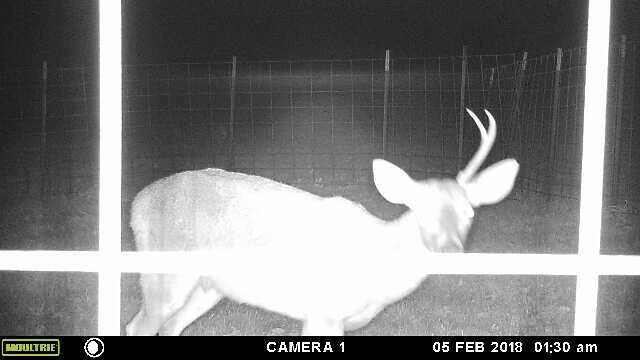 I caught one 4 times in my corral trap before I went from 4' to 5' panels. He had 1 eye so I know it was the same hog. 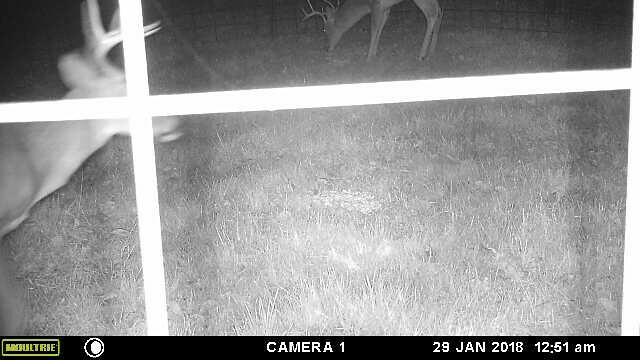 He'd get caught between midnight and 3AM, eat all the corn, and either climb or jump out before I got there that morning. So much for the theory of them learning to fear traps, or this was just one really stupid one-eye'd boar. The big sows are the ones I was mainly talking about. Last time I had this trap set I caught 17 hogs from little ones to a sow about 100/125 lb. The big sow didn't go in. 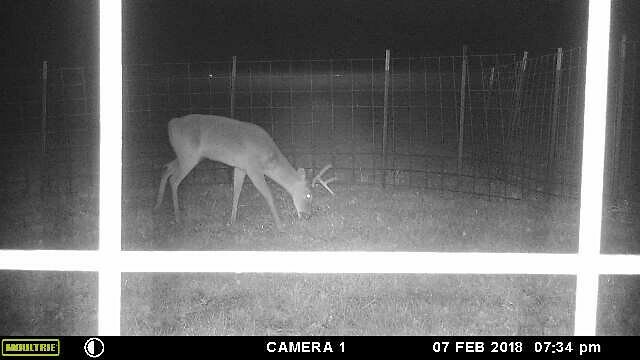 I had the gate open for a week and had multiple pics of her outside the trap while the rest of them ate corn. She made the mistake of hanging around though and my buddy capped her a few nights later.